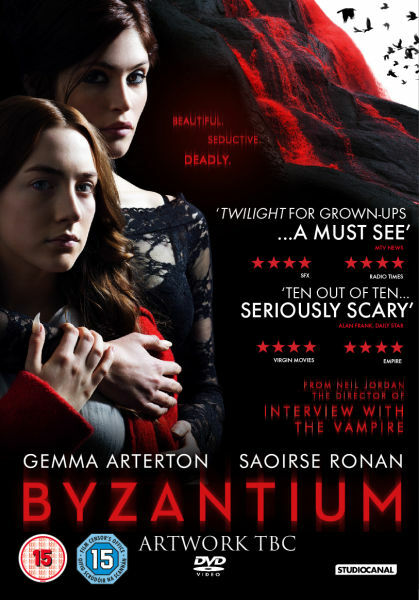 Saw Byzantium last week, and yeah, you can bet my initial interest was due to its title. The protagonists of the movie are two female vampires who have a mother and daughter relationship, played by Gemma Arterton and the other worldly Saoirse Ronan respectively, they are trying to evade an order of male vampires. It probably could be quite strongly interpreted by feminist theory with arguments concerning agency but that's not an approach I could take comfortably and I am sure someone else probably will do that better, if it becomes significant. I saw it with a friend with a stronger literary background, he tended to take a critical approach to the movie, I quite liked it for its new features. It is directed by Neil Jordan. The dialogue of the characters for the most part appears natural, in a movie context, the speech of Gemma Arterton's character, Clara, evokes a working class Victorian background. The visual representations of the city, town and coast are for the most part mundane and the concerns of the protagonists are within the spectrum of humanity, mostly trying to survive by doing what they know. There are no sky scraper scenes with actors in gothic clothing bearing symbols of authority, efficiency, weapons or vestiges of a pan opticon view that evokes power structures. If I had to make a comparison I would compare it to "Near Dark" in terms of the coterie, group dynamic focused narrative. The creation story for Gemma Arterton's Clara begins during the Napoleonic period on the English coast, possibly the vampires are creatures of habit and have returned to an old location that has been built up by modernity. The circumstances of Clara's creation to me evokes Pierre Choderlos de Laclos "Les Liaisons Dangereuse", which is because it probably has similar themes and settings. I found myself more concerned with the fate of the mortal humans that the vampires interact with than the vampire protagonists but that is probably what makes it work as a thriller. The cool title is a reference to the name of the Hotel that the vampire protagonists take up residence and possibly a more awkward reference to a "sword from the fall of Byzantium" that one of the male vampires bears.